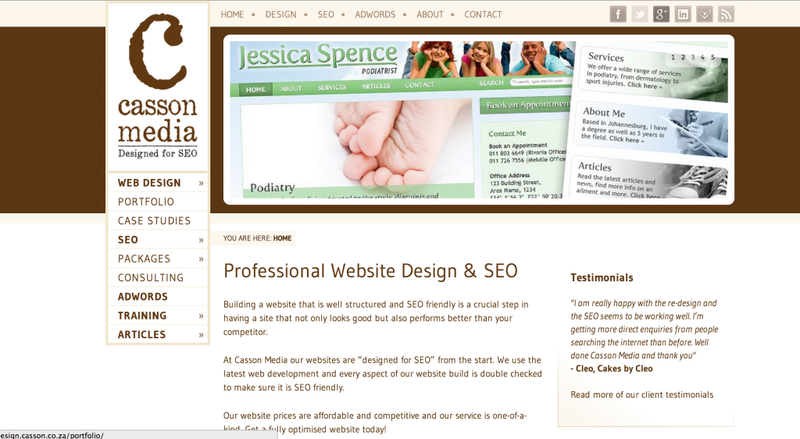 Many clients have asked if I do website design, and the answer has always been “No”. I am not a designer and I do not intend to become one either, however, I am constantly informing my clients to update, rebuild and modernise their outdated sites and apply structure changes, which sometimes lead to costly updates. Well, I have seen the demand in having sites built to SEO standards, so have decided to offer this service to our clients. We are proud to announce that SEO Cowboy and Creative Addict are now divisions of Casson Media, a new online marketing company that understands the importance in designing & building websites with SEO in mind from the start. Creative Addict will head up the Creative Department and SEO Cowboy will head up the Online Marketing Department. For easy navigation, we have split casson.co.za into two departments. Each department has all the answer pertaining to their industry as to better understand all our services. This also allows the client to easily contact the correct department. What Will Happen to SEO Cowboy? SEO Cowboy will be renamed “Bryan Casson” and become the official SEO Blog for Casson Media. We will continue to bring you latest in SEO news and advice. Is SEO Training Necessary for Your Company?